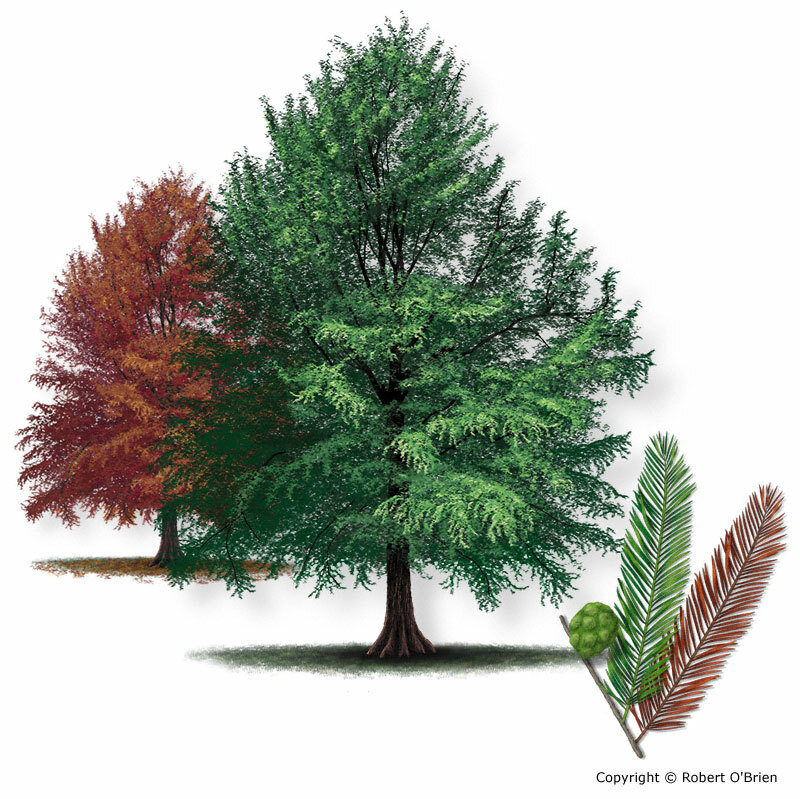 One of the few deciduous conifers of North America, baldcypress is a large tree to over 100 feet tall and a straight trunk to 8 feet in diameter, with numerous ascending branches. Young trees display a narrow, conical outline, but old trees have a swollen, fluted base, a slowly tapering trunk, and a broad, open, flat top. In swamps they develop distinctive woody growths from the root system called "knees." In East Texas, west to the Nueces River and Central Texas, growing on riverbanks, bottomlands, and in swamps which are flooded for prolonged periods. Planted widely as a landscape tree. The slender, light green leaves are flattened, about 0.5" to 0.75" long, very narrow, and arranged in feather-like fashion along two sides of small branchlets 2" to 4" long, which are deciduous in the autumn with the leaves still attached. Flowering branchlets sometimes have awl-like leaves. Fall color is a striking copper or reddish-brown. Male conelets or "flowers" arranged along a thread-like catkin 3" to 4" long, appearing in the spring; female conelets small and inconspicuous. A rounded cone about 1" in diameter, wrinkled into thick rough scales, greenish or with a waxy coating. Silvery to cinnamon-red, with papery scales on branches but developing larger flat-topped ridges and numerous longitudinal fissures with age. Light, soft, easily worked, with a light-colored sapwood and dark brown heartwood. It is particularly durable when exposed to soil and water, so cypress is in demand for exterior trim, boat and ship building, shingles, posts, poles, etc. Also in demand as a landscape tree. Montezuma baldcypress (Taxodium mucronatum) has longer male flower catkins in the spring. Central Texas populations of this species do not produce the woody "knees," the function of which is not known. They may serve to help balance the tree on soft, muddy soils.